MONTREAL — Antti Niemi won the battle of the backup goalies. 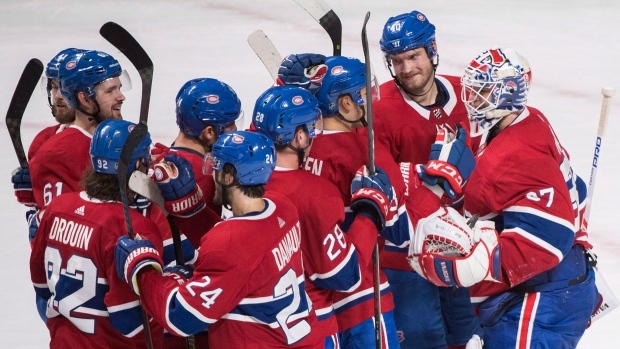 With Carey Price out with the flu, Niemi made 25 saves as the Montreal Canadiens beat the visiting Pittsburgh Penguins 4-3 in a shootout on Saturday night. Niemi also stopped both shots in the shootout — on Evgeni Malkin and Sidney Crosby. "It was a tough first half, didn't see many pucks and I gave up a few goals," said Niemi, who made his first start of the season. "Not what you normally want to see. In the third, I started seeing a few more pucks and I was feeling good. "I have to be really happy with my night. Right now I feel really good." With the score tied 3-3, the Canadiens netminder made 14 stops in the third period and another three in a frantic overtime period that saw Montreal fail to score on a 4-on-3 power play. After Paul Byron scored first in the shootout for Montreal (2-1-1), Niemi forced Malkin to the outside and completely took away his shooting angle. With Jonathan Drouin also scoring, Sidney Crosby had a chance to keep Pittsburgh alive but the Pens captain found Niemi's glove instead. "Stay with them, get a good gap and go from there," said Niemi of his shootout heroics. "Nothing special." Opposite Niemi, Pittsburgh's Casey DeSmith stopped 37-of-40 shots in place of Matt Murray, who just recovered from a concussion and was on the bench. Making the 13th start of his NHL career, the 27-year-old DeSmith made big saves when it mattered most to help Pittsburgh (2-1-1) earn a point. With seven minutes left in the game, DeSmith robbed Artturi Lehkonen twice to keep the teams level. In overtime, DeSmith frustrated Max Domi from in close. "That was wild," said DeSmith, who made 35 saves in a 4-2 win over Vegas on Thursday. "Really exciting game for the fans. Happy we got a point but I hate losing as much as everyone else. I was seeing the puck really well tonight. Happy with how my game's progressing." Added Penguins coach Mike Sullivan of his goalie: "I thought he was terrific." Montreal also defeated Pittsburgh 5-1 last Saturday. After the Pens went up 2-0 in the first period through Dominik Simon and Kris Letang, the Canadiens came out buzzing in the second as they outshot the visitors 19-4. Tatar got his second of the game, on the power play, by firing the puck off DeSmith and in from the side of the net at 8:51. "We knew we weren't good enough in the first and we talked about how we needed to be better," said Tatar, who joined Montreal in the off-season trade that sent former captain Max Pacioretty to Vegas. "We got a pretty good jump at the start of the second period. "Everyone played well in the second period and we had a lot of pressure. We all deserve the credit." With the Pens on a man advantage, Phil Kessel made it 3-3 from the slot at 11:14 of the second. Pittsburgh defenceman Justin Schultz left the game in the first period and did not return. Schultz's leg folded awkwardly as fell to the ice after taking a hit by Tomas Plekanec, who made his 999th career start. "It's tough," said Crosby of losing Schultz. "We've been in that situation before. The defence did a good job of keeping it simple. But we have to help each other out when we're in a situation like that to take the pressure off and we probably cold have done a better job of that."